On January 20, 1965 the Kansas City Chiefs traded HB Abner Haynes straight-up to the Denver Broncos for LB/P Jim Fraser. Haynes was considered the American Football League’s first home-grown star. A native Texan, he had played college football at North Texas State, where he was an outstanding performer. 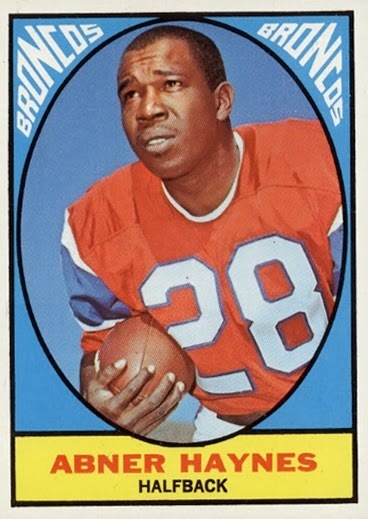 The Dallas Texans of the new league won a bidding war with the NFL’s Pittsburgh Steelers and Winnipeg of the CFL to get him for the 1960 season, and were rewarded when Haynes led the AFL in rushing (875 yards), punt returns (15.4 avg. ), and all-purpose yards (2100). At 6’0” and 185 pounds, he was fairly small and lacked power, but was fast and shifty with excellent running instincts. He was a fine receiver out of the backfield (55 catches, 576 yards) and kick returner as well as runner from scrimmage. With his tendency to hold the ball away from his body when running, he was also prone to fumbling, but he made up for it with his exciting all-around play and quickly became a favorite of the fans. 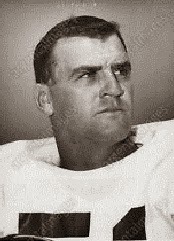 Haynes was named AFL Player of the Year as well as Rookie of the Year for ’60. He continued to be an outstanding performer in 1961 and ’62, the latter being his greatest season. He rushed for over a thousand yards (1049) and led the league in yards from scrimmage (1622) and touchdowns (19). The Texans won the AFL Championship in a game that featured Haynes starting off at flanker before moving back to halfback and scoring a touchdown on a pass play. Dallas won in overtime, although Haynes nearly was the goat when, after winning the coin toss for OT, as a captain for the team he mistakenly elected to kick rather than choose an end of the field to defend, as instructed by Coach Hank Stram due to the windy weather conditions. Fortunately, it didn’t cost the Texans the game and Haynes crowned an outstanding three years in Dallas with being member of a Championship team. The franchise may have achieved the pinnacle of success in Dallas, but had lost money in competition with the NFL’s Cowboys. Owner Lamar Hunt moved it to Kansas City, where the team was rechristened the Chiefs. However, during the preseason, a tragedy occurred which profoundly affected the team, and in particular Haynes. HB Stone Johnson, a sprinter with tremendous speed, was drafted by the Chiefs and suffered a fatal neck injury while attempting a tackle on a preseason kickoff return. Haynes had befriended the younger player and Johnson’s death had a profound effect on him. His style of play was more restrained and, in what became a lesser season for the entire club, Haynes rushed for just 352 yards on 99 carries (3.6 avg.) and his overall total of 1196 yards was well below his prior standards. Haynes bounced back somewhat from the bad year in 1963 with 697 rushing yards on 139 attempts, 562 more yards on 38 catches, and a total of 1548 all-purpose yards in ’64. He was shifted to split end at the beginning of the year, when veteran Chris Burford was injured, but moved back to halfback with good results. However, Haynes felt he was not being used properly by the Chiefs and welcomed the trade, saying “I think it will be better for me and for Kansas City.” The Chiefs were looking for depth at linebacker, especially after star MLB E.J. Holub underwent knee surgery. In addition, rookie FB Mack Lee Hill had played well, in addition to HB Bert Coan, which factored in the decision to deal Haynes. As for the 28-year-old Jim Fraser (pictured at left), he had led the AFL in punting average for two straight years while also starting at outside linebacker. In Kansas City he was strictly a backup at linebacker and unneeded as a punter, with Jerrel Wilson ably handling that department. After one season, he was traded once again, this time to the Patriots. The Broncos had been a perennially lackluster team and the trade for Haynes, along with a deal that brought in the temperamental but highly talented FB Cookie Gilchrist from Buffalo, was part of an effort to revive the franchise. Haynes was expected to compete with HB Charley Mitchell, who was coming off a good year in ’64, gaining 815 yards from scrimmage (590 rushing, 225 pass receiving). But it was HB Wendell Hayes who had an outstanding rookie year in ’65 and relegated Haynes to a backup role (Mitchell missed virtually the entire season with a thigh injury). Haynes ran the ball just 41 times for 166 yards (4.0 avg.) and caught 26 passes for 216 yards. He had a bigger impact as a kick returner, running back 34 kickoffs for 901 yards and a league-leading 26.5 average and also averaging 8.6 yards on 14 punt returns that included a touchdown. Haynes moved back into the starting lineup in 1966 when Hayes was shifted to fullback. His rushing numbers were unimpressive as he gained just 304 yards on 129 carries for a 2.4-yard average. However, as a receiver out of the backfield he led the club with 46 pass receptions, gaining 480 yards. He was used less often as a kick returner, but still averaged 11.9 yards on 10 punt returns and had a total of 1132 all-purpose yards. On the downside, he also led the AFL by fumbling 11 times. With the arrival of HB Floyd Little, the All-American out of Syracuse who was taken by the Broncos in the first round of the ’67 combined AFL/NFL draft, Haynes was dealt to the second-year Miami Dolphins. He had a big day in the season-opening game, which happened to be against Denver, and ran for 151 yards on 12 carries (his only hundred-yard rushing performance after leaving the Chiefs). However, he was used sparingly thereafter and was waived 11 games into the season. The Jets picked him up to shore up an injury-depleted backfield, but he saw little action and, at age 30, retired following the season. An electrifying performer in his early years, Haynes showed flashes of that form in his two years in Denver. But with a poor team (the Broncos went 4-10 in each season), and no longer able to produce with the same consistency, his time in Denver was largely undistinguished. He left the AFL after having gained a career total of 12,065 all-purpose yards, 2536 of which were generated with the Broncos.